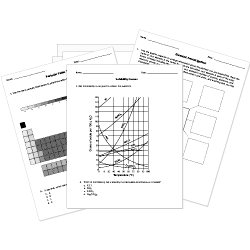 You can create printable tests and worksheets from these Grade 5 Chemistry questions! Select one or more questions using the checkboxes above each question. Then click the add selected questions to a test button before moving to another page. Particles of matter that move faster (like in a gas) have more of what? closer together than in a solid and further apart than in a gas. are spaced the same as in solids and gases. closer than in gases but further apart than in solids. Which of the following is a characteristic of liquids? The amount of matter in an object is its . A(n) is the smallest unit of an element that has the properties of that element. Select whether the example is a chemical change or a physical change. Ice is the form of water that has particles moving the . What are the 3 most common forms of matter on Earth? Volume is the measure of how much space an object takes up. A change in matter that does not form a different kind of matter is called a change. When a liquid changes to a gas it is called .